My husband and I are both in our mid-thirties and grew up with Roald Dahl. I recall visiting my local library and every week checking with great excitement the ‘D’ section to see if he had brought out any new books. He was our favourite author when we were children. 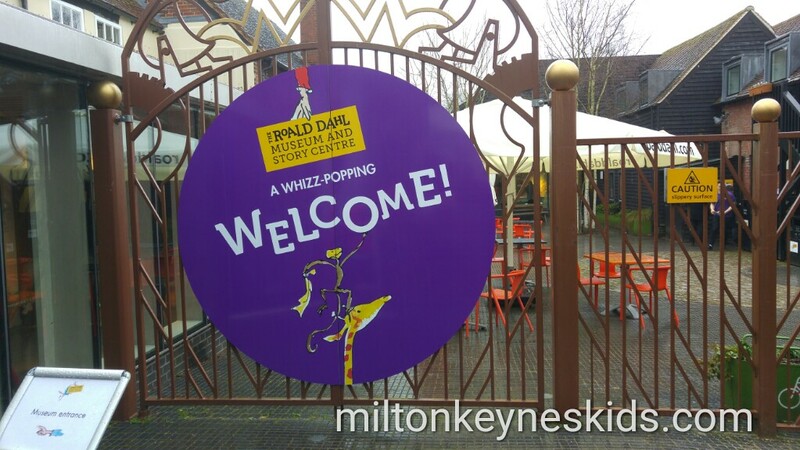 So on a wet weekend in January 2017, we discussed whether we should visit the Roald Dahl Museum and Story Centre in Great Missenden. 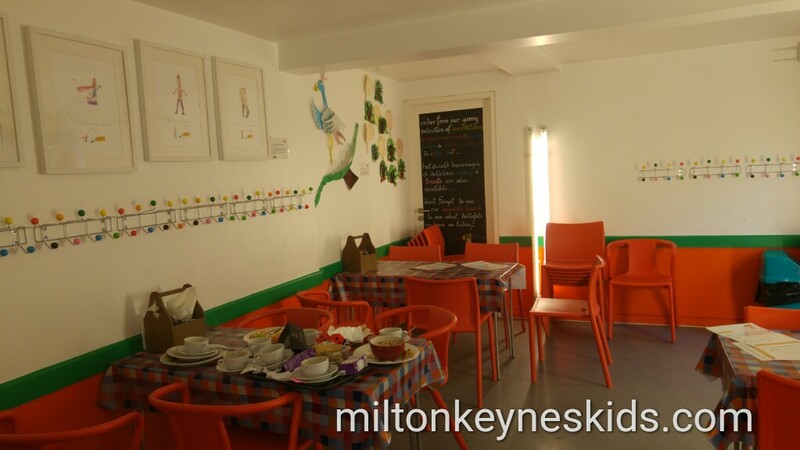 In all honesty, I wasn’t sure, it’s about 50 mins from where we live in Milton Keynes, and as much as it looked fun on the website, it does say it’s most suitable for 6-12 year olds. As I write this, my boys are 18 months and 3 and a half, so their knowledge and experience of Roald Dahl is quite limited. That said, my eldest has watched the new BFG film and the old Willy Wonka and the Chocolate Factory, and he really enjoyed them. And under 5s go free. We decided to go. Watch the video below and then scroll down for our review and pictures. What’s the Roald Dahl Museum like? If you’re expecting a large, lavish museum complete with film sets like the Warner Brothers Studio on an industrial estate then it’s nothing like that. The Roald Dahl Museum is in the beautiful village of Great Missenden – where the author lived for 36 years. It doesn’t have its own car park. The museum is quite small with three galleries. Boy gallery looks at Roald Dahl’s school days while Solo gallery houses his original writing hut.There’s quite a lot of information in them and some hands-on activities. It’s all about Roald Dahl’s life rather than his individual books. We arrived at about 11.30am on a wet Sunday and it was really busy. 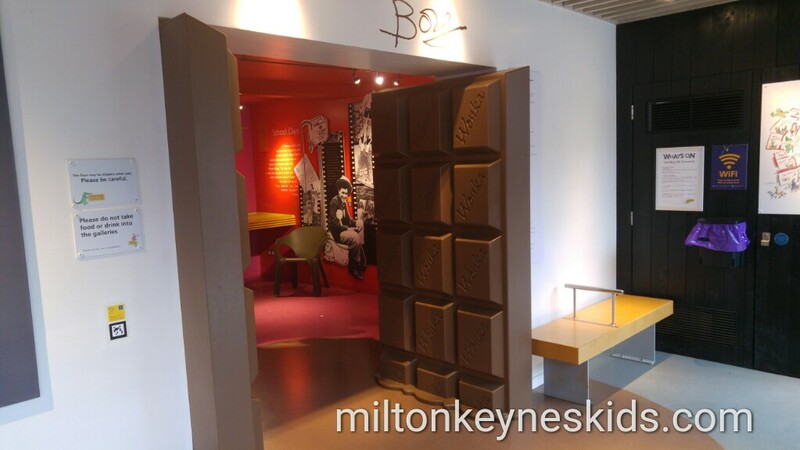 My eldest loved the Wonka bar themed chocolate doors at the entrance to the first gallery. My youngest liked sitting in a Gladiator cockpit, although it was really popular so we had to go back to have a turn at the end of our visit. Sophie’s outfit from the BFG film is there. 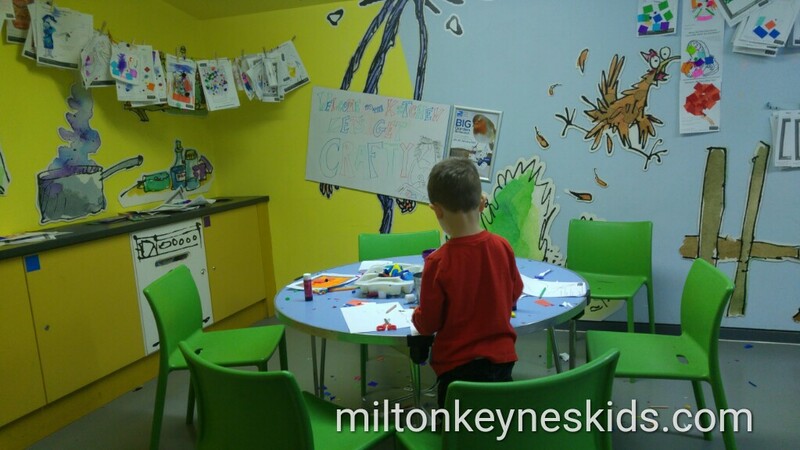 The largest gallery has a number of activities for children including word puzzles and a craft area. Again the craft area was rammed so we had to wait a while before we could go in there. They did lots of cutting and sticking. I’m not sure what they were meant to be making but they had fun. 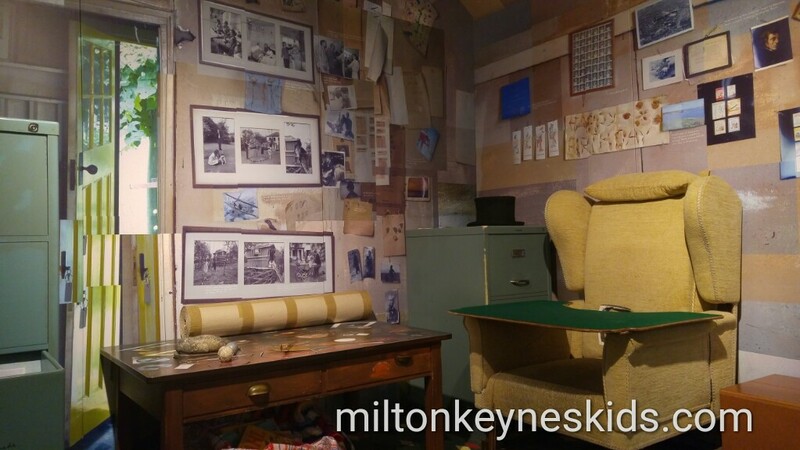 There’s a Fantastic Mr Fox display and a replica of Roald Dahl’s writing chair. After lunch we went back through the galleries again before looking round the shop. The Roald Dahl museum shop is fab – perfect for any fan of the author. We took a picnic. We take a picnic everywhere. The courtyard area would, I’m sure, be lovely on a nice day – we took our food into the café spill-over room which was empty and ate there. 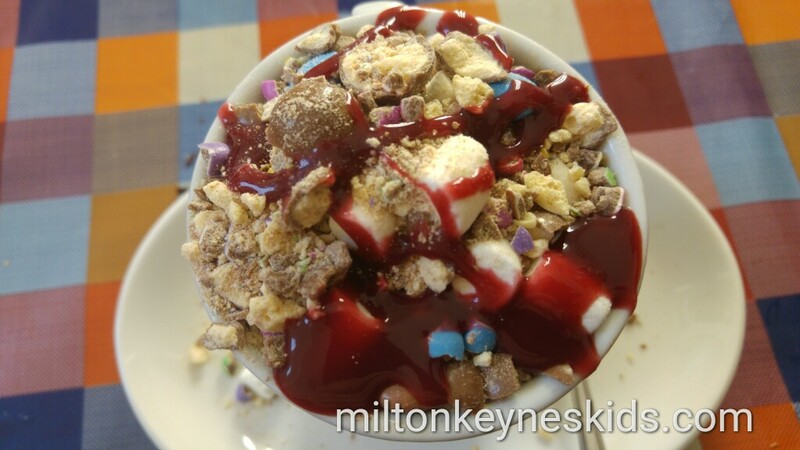 My husband and I were both delighted to discover some Roald Dahl themed drinks and we picked the ‘Whizzpopper’ – swirls of foamy hot chocolate with marshmallows, smarties and crushed maltesers, topped with raspberry coulis. 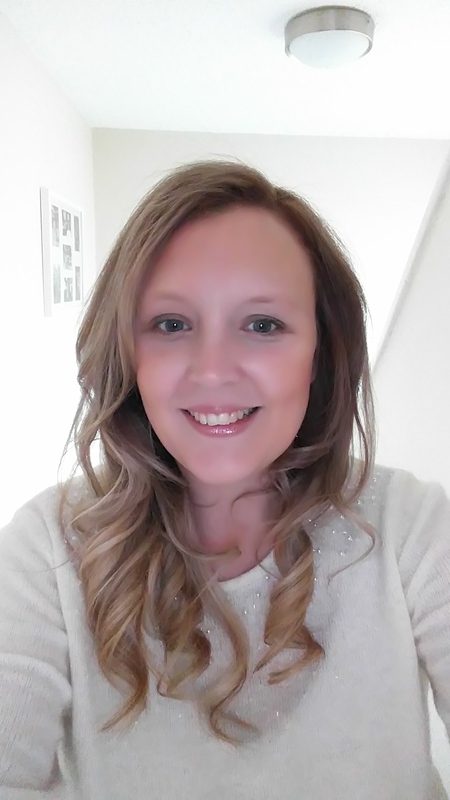 It had the best topping of any drink we’ve ever had – needless to my eldest had much of it. The café also serves sandwiches and stuff. As we left the museum we saw the Danny the Champion of the World petrol pump on our left which is cool and worth taking a picture of. It was pouring of rain the day we went so we rushed back to the car park, but on a nice day the museum provides you with a map which includes details of walks you can go on to explore Great Missenden and see the house that was the inspiration for Sophie’s norphanage in The BFG, Matilda’s library and Roald Dahl’s grave. Head further afield on the countryside trail to explore Angling Spring Wood, said to be the inspiration for Fantastic Mr Fox, and try out activities and games such as Woodland Bingo and Ranger’s Radio. There’s apparently an archive room which houses more of the Roald Museum Collection and includes a mechanical Oompa Loompa – that I’d love to see. So would I recommend taking under 5s? Well I’d say if you want to go because you loved Roald Dahl as a child then go, it’s interesting. My 3 year old had fun and there was some stuff he could do. The little one liked going in and out of the plastic yellow curtains. What I would say though is that children aged 6+ who are reading Roald Dahl will of course get the most out of it. That said, since we went, I’ve opened up my boys’ Roald Dahl Treasury and my eldest is really enjoying listening to me read extracts of some of the books to him – The Twits especially – although I’d forgotten how awful the Twits actually were. We drove. It took about 50 minutes from Milton Keynes. 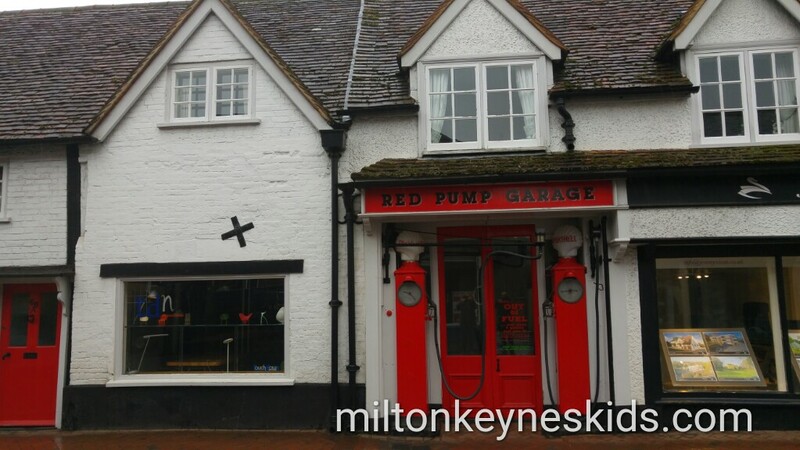 The address is 81 to 83 High Street, Great Missenden, Buckinghamshire, HP16 0AL. You can put that postcode in to your sat nav. But before you get there, look out for the main public car park for the museum. Take some change with you, charges apply Mon-Sat. On Sundays when we went it was free to park. Do check that when you visit though in case it has changed. The Roald Dahl Museum is a charity.Tickets are £6.60 an adult. £4.40 for a child. Under 5s free. Open Tues-Sun and selected Mondays. Do book tickets in advance if you’re going at busy times like school holidays. There’s more information on their website. If you’ve been there, I’d love to know what you think! 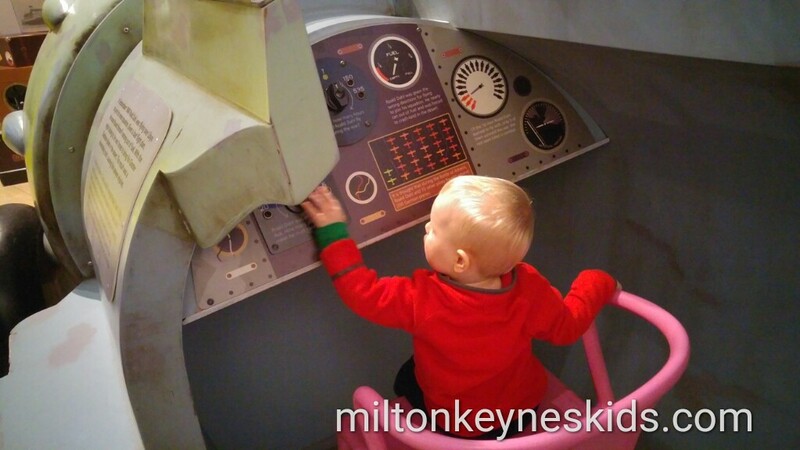 Leave me a comment below and email me any pictures of your adventures to laura@miltonkeyneskids.com.